We sometimes have to test the local emergency switchboard operators and I have some of the older role-plays left over. So, here they are. 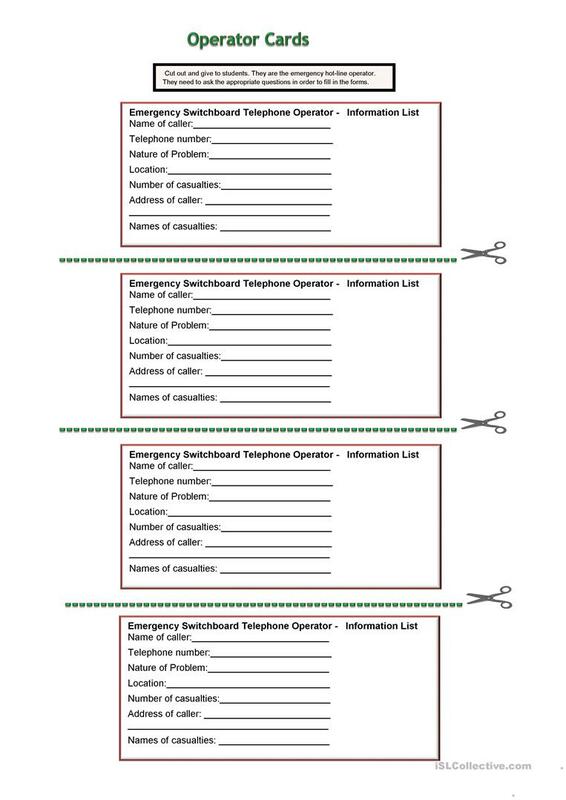 Cut out the cards and divide them into “operator cards” and “casualty cards.” On a board make a mind map of the kinds of questions emergency switchboard operators and accident victims would ask each other. 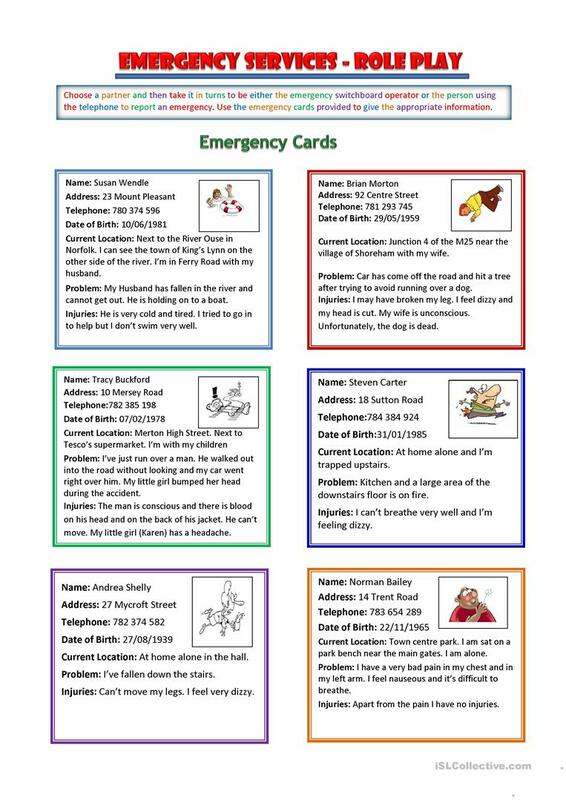 Give an operator card to one student and a casualty card to another. The student with the operator card is on the emergency switchboard and must answer a ringing phone. The student with the casualty card must provide and answer relevant questions while the operator must ask for the appropriate details and decide on a course of action while giving suitable advice. 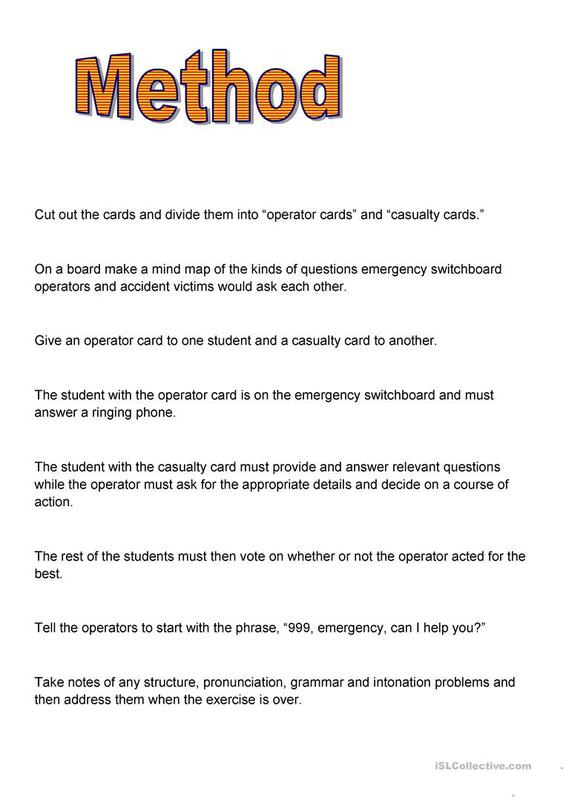 The rest of the students must then vote on whether or not the operator acted for the best. Tell the operators to start with the phrase, “999 emergency. Can I help you?” (911 for our cousins across the pond) Take notes of any structure, pronunciation, grammar and intonation problems and then address them when the exercise is over. The above downloadable teaching material is best suited for business/professional students, high school students and adults at Intermediate (B1) and Upper-intermediate (B2) level. It is great for practising Questions (interrogative) in English, and is a valuable material for developing your groups' Speaking skills. It features the topic and words of Accidents. Spinney is from/lives in Spain and has been a member of iSLCollective since 2012-01-15 12:22:41. Spinney last logged in on 2019-04-22 20:49:03, and has shared 141 resources on iSLCollective so far.